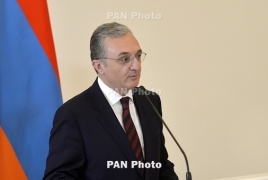 Armenian, Azerbaijani Foreign Ministers to meet "soon"
PanARMENIAN.Net - A meeting between Foreign Ministers of Armenia and Azerbaijan will happen very soon, Armenian Foreign Minister Zohrab Mnatsakanyan told a joint press conference with Secretary General of the International Organization of La Francophonie Michaëlle Jean, who has arrived in Armenia on an official visit. "We will announce a meeting between the Foreign Ministers of Armenia and Azerbaijan upon agreement," Mnatsakanyan said on Tuesday, September 1. Earlier, the Secretary General visited the Armenian Genocide memorial where she laid a wreath at the memorial and flowers at the eternal flame. Former Azeri leader "negotiated conflict with Karabakh ex-President"
Pashinyan weighed in on the settlement process and maintained that the issue can’t be solved without Karabakh’s involvement. The Italian Senate in 2020 approved a bill criminalizing the denial of genocides. It stipulates 3-year imprisonment and a fine. Pashinyan said Armenia will respond to Azerbaijan's threats of war with peace or, if necessary, peace enforcement. The Foreign Affairs Committee had offered the parliament to adopt the law ratifying the document without amendments. Mass casualties after Sri Lanka bombings in churches and hotels The first explosion was reported in a church located in the capital. The other blasts followed within half an hour. Bees living on Notre-Dame cathedral roof survive fire High temperatures would have posed the biggest risk, but Géant explained that any smoke would have simply intoxicated them. Moral decisions linked to brain activity: study The findings revealed that "unique patterns" of brain activity underlie the inequity aversion and guilt aversion strategies. Turkey angry over Macron's meeting with Syrian Kurds Ankara accused Macron of "attempting to give artificial legitimacy to a terrorist organization and its extensions."